The summer that Nixon resigns, six teenagers at a summer camp for the arts become inseparable. Decades later the bond remains powerful, but so much else has changed. 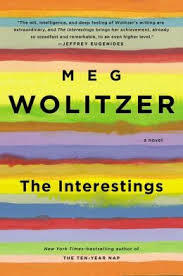 In The Interestings, Wolitzer follows these characters from the height of youth through middle age, as their talents, fortunes, and degrees of satisfaction diverge.The friendships endure and even prosper, but also underscore the differences in their fates, in what their talents have become and the shapes their lives have taken. Wide in scope, ambitious, and populated by complex characters who come together and apart in a changing New York City, The Interestings explores the meaning of talent; the nature of envy; the roles of class, art, money, and power; and how all of it can shift and tilt precipitously over the course of a friendship and a life. I enjoyed this book for sure. So we gather from the summary that this novel focuses on talent, success, friendship, and love. Friendship and love you can find by the bucketful in any novel, but the value in The Interestings for me was really it's study of talent and success. D and I, along with most of our peers, are at an age where we think long and hard about how we would define a successful life, so this book seemed well-timed to my own experience and also a bit of a warning (spoiler alert: not all of the characters have the "right idea" when it comes to the value one places on monetary and emotional success). The characters, however flawed, were so well portrayed off the bat that I didn't mind so much that they saw relatively little development or personal growth over the 40 years we follow them. I mean seriously. The personality flaws of these 15 year olds are the same flaws at 50, but it was still compelling to see them play out. I've heard mixed reviews, but I enjoyed this one, and I'm comfortable recommending it.